We’d love your help. 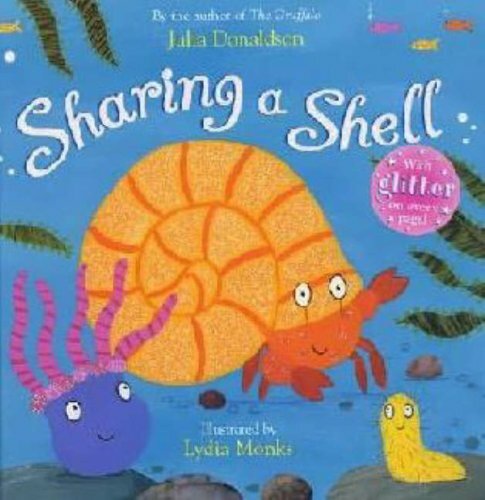 Let us know what’s wrong with this preview of Sharing A Shell by Julia Donaldson. To ask other readers questions about Sharing A Shell, please sign up. Former Children's Laureate Julia Donaldson is basically the goddess of wordsmithery, as far as I can tell. She's most famous for creating The Gruffalo with Axel Scheffler but has also written about a billion Oxford Learning Tree early readers and a number of lovely books with illustrator Lydia Monks. Sharing A Shell tells the story of three rock pool creatures who share a shell and overcome their differences to live in harmony for the greater good. It has some lovely lessons about tolerance and Former Children's Laureate Julia Donaldson is basically the goddess of wordsmithery, as far as I can tell. She's most famous for creating The Gruffalo with Axel Scheffler but has also written about a billion Oxford Learning Tree early readers and a number of lovely books with illustrator Lydia Monks. Sharing A Shell tells the story of three rock pool creatures who share a shell and overcome their differences to live in harmony for the greater good. It has some lovely lessons about tolerance and sharing, two qualities which, as we all know, come as second nature to toddlers. Violent cannibalistic adventure featuring three rootless wanderers drifting from one temporary abode to another, constantly menaced by vast predatory monsters. The thing that gets me every time with this story, is that as I read it (probably twice every day in a somewhat singsong style), Crab falls out with the other two because they are too *heavy*, but clearly that isn't the case because later on all three get back together in a bigger shell and there are no weight related issues. They had simp Violent cannibalistic adventure featuring three rootless wanderers drifting from one temporary abode to another, constantly menaced by vast predatory monsters. Sharing a Shell starts with a crab searching for a new home as he has outgrown his current one. Upon finding a new shell and moving in a worm asks if he can move in with him and he offers to keep the shell clean in return, to which the crab agrees. Next an anemone moves in with the promise to protect the crab and worm from enemies. Soon the three characters outgrow the shell and argue leading to them going their separate ways. However, a storm occurs and the worm finds a bigger shell to accommod Sharing a Shell starts with a crab searching for a new home as he has outgrown his current one. Upon finding a new shell and moving in a worm asks if he can move in with him and he offers to keep the shell clean in return, to which the crab agrees. Next an anemone moves in with the promise to protect the crab and worm from enemies. Soon the three characters outgrow the shell and argue leading to them going their separate ways. However, a storm occurs and the worm finds a bigger shell to accommodate them all and they soon move back in together. The book explores friendships and relationships, of how the characters can co-operate with each other to make a lovely place to live even though they are not the same species. This can be expanded upon to explore the different communities children live in and how/if they work to make a nice environment to live in. Sharing a Shell also highlights the importance of each character, as without each other they are lonely and the shell will be dirty, at risk and unable to move around. Children can then expand on this to see what jobs there are within the UK and the World over and how they assist the people who live there. Sharing a Shell uses rhyme to tell the story, this allows for children to explore the world of rhyme and start to look at how to use it themselves in writing. Also, the child can discover what makes words rhyme including the phonic sounds heard in the word. 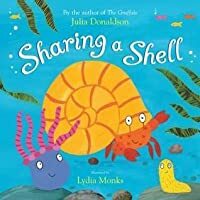 Sharing a Shell is a brightly and well illustrated book, having a lovely story of friendship which leads children (and adults) to read it over and over again. Ah this book was a pleasure to read my Year 1's for their story time today. The cover gave a great starting discussion with the pupils, stimulating their imagination and comprehension. The "bristleworm" was given many names before we started the book. I struggled with the word "anemone" a tongue twister for me but he was called the purple blob so made life easier for me. This book allowed me to relate to their own experiences of arguing with friends, going their own separate ways, feeling sad and l Ah this book was a pleasure to read my Year 1's for their story time today. This book allowed me to relate to their own experiences of arguing with friends, going their own separate ways, feeling sad and lonely and then making friends. It allowed me to really highlight the importance of sharing and being nice together which all the pupils got this message at the end. And the pupils were amazed at the pictures too! Read this to my infant daughter. A clever rhyming tale about the value of friendship & sharing. Lydia Monk's vibrant illustrations are sublime, captivating the interest of young & old readers alike. 5 yildiz ama Turkce cevirisi icin bence 4 yildiz belki de cok beklenti icine sokuldugumdan yargimin agirlasmasi sonucu olabilir. Bilemiyorum. Ancak cocuk kitabi olmasina ramen Turkce’si cok agir cevirilmis. Aslinda kafiyeler yapilmaya calisilmissa da akicilik yok. Bu nedenle cocugun takibini zorlastirabilir. Yine de hem paylasim hem de arabuluculukla ilgili cok guzel bir konu islenmis. Alip cocugunuza siz okuyabilirsiniz. 3-4 yas araligindan 1. Sinifa dek bu kitap alinabilir. Turkcesi icin, siz o 5 yildiz ama Turkce cevirisi icin bence 4 yildiz belki de cok beklenti icine sokuldugumdan yargimin agirlasmasi sonucu olabilir. Bilemiyorum. Ancak cocuk kitabi olmasina ramen Turkce’si cok agir cevirilmis. Aslinda kafiyeler yapilmaya calisilmissa da akicilik yok. Bu nedenle cocugun takibini zorlastirabilir. Yine de hem paylasim hem de arabuluculukla ilgili cok guzel bir konu islenmis. Alip cocugunuza siz okuyabilirsiniz. 3-4 yas araligindan 1. Sinifa dek bu kitap alinabilir. Turkcesi icin, siz okursaniz daha iyi olacagindan, 4-5-6 yaslar icin oneririm. Sonra kitapliginda kalabilir ve artik hikayeyi bildigjnden anlamina yogunlasabilmek icin zaman zaman kendisi yatmadan once okumalarina dahil edebilir. You know you’re in for a treat when a book has a glittery front cover and ‘Sharing A Shell’ by Julia Donaldson doesn’t disappoint. With the lyrical and rhythmic verse we come to expect from her popular picture books, she tells a tale of friendship and collaboration. After finding a shell and teaming up with an anemone and a bristleworm, crab learns that when faced with the challenges a stormy sea throws at him he is better off with his new friends than on his own. 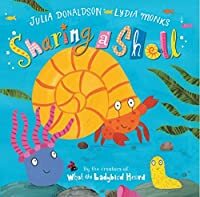 Read the full review here: https You know you’re in for a treat when a book has a glittery front cover and ‘Sharing A Shell’ by Julia Donaldson doesn’t disappoint. With the lyrical and rhythmic verse we come to expect from her popular picture books, she tells a tale of friendship and collaboration. After finding a shell and teaming up with an anemone and a bristleworm, crab learns that when faced with the challenges a stormy sea throws at him he is better off with his new friends than on his own. A beautifully illustrated story book with glitter detailing on each page. This is a story about a snail in search of a new shell, along with the help of a few friends along the way. The book could be used as an example of conflict resolution between friends, despite their many differences. Great for promoting sharing and teamwork. A nice idea and I like how little ones can learn about bristle worms and anemones through it. Rhyming, great art, lovely, short, little story. My kids at work love this book! And it is easy and delightful to read your then. The story is about a crab that has no shell. A seagull chases the crab, the crab find safety in an empty shell on the beach, and sets up home in a rock pool with his shell. The crab then meets an anemone, who asks to share his shell. The anemone says he can help the crab by stinging predators with his tentacles. Now there are two friends sharing the shell in the rock pool. Then a bristleworm asks to share the shell with the two friends, saying he can help by keeping the shell lovely and clean. Then there were three friends sharing the shell in the rock pool. However the bristleworn and anemone grow and they become too heavy for the crab to carry on the shell. They all spilt up and find new homes, bristleworn, knows that the three friends are all sad now they are separated. That night a storm hits and all their homes get smashed on the rocks. They then find a new sparkly shell and all live together again happily, three friends sharing a shell. The book has fantastic colourful pictures to bring the story alive and draw the reader in. It even has a textured feel from the glitter. The story highlights the importance of friendship and how we all can offer different things to help one another. The book shows we all have different strengths and they are useful in their own way. It also shows along the way we will have arguments as friends but they can be resolved and a strong friendship will continue. Foundation and KS1 book. This story highlights the importance of sharing and cooperation. The story begins with the crab seeking a shell to inhabit and shows that many creatures that he encountered were not willing to share their shells with him. The crab finally finds a vacant shell to protect him from the dangers of his environment. During the story the crab encounters an anemone and a bristleworm, both of which he was initially unwilling to share his shell with. It is seen that by cooperating together and sharing the This story highlights the importance of sharing and cooperation. The story begins with the crab seeking a shell to inhabit and shows that many creatures that he encountered were not willing to share their shells with him. The crab finally finds a vacant shell to protect him from the dangers of his environment. During the story the crab encounters an anemone and a bristleworm, both of which he was initially unwilling to share his shell with. It is seen that by cooperating together and sharing they created a good team and all individually contributed to the benefits of living together in one shell. Until one day they had all grown too big to share the shell and had become ungrateful of each other and decided to split up finding individual homes. They discovered after a terrible storm a beautiful shell and decided to share the shell as a home for three where they were all a lot happier than when they had their own individual home. This book helps illustrate to children the importance of sharing and that each individual has their own strengths which can work and benefit all as part of a team if they decide to cooperate. This story emphasises team work. I would recommend this book for key stage 1. This book could be used as a focus and springboard into discovering and learning about habitats. I really enjoyed this book – I think all Julia Donaldson books are simply fantastic and children love hearing them over and over again. The story is about a hermit crab who finds a shiny shell that he does not want to share with anyone. However he comes across an anemone who suggests if the crab shares the shell, he will protect it from fish. Next, a bristleworm tries to get in the shell too, but the crab tells it to go away. It suggests doing all the housework if the crab lets it stay, so they I really enjoyed this book – I think all Julia Donaldson books are simply fantastic and children love hearing them over and over again. The story is about a hermit crab who finds a shiny shell that he does not want to share with anyone. However he comes across an anemone who suggests if the crab shares the shell, he will protect it from fish. Next, a bristleworm tries to get in the shell too, but the crab tells it to go away. It suggests doing all the housework if the crab lets it stay, so they became three friends sharing a shell. They soon grew too large for the shell, and had to find their own homes – this made them lonely and sad. But then a storm came and their shells were damaged, so they resulted in finding a large shell where they could all live happily together. Lydia Monks uses wonderful colours and glitter when illustrating this lovely book about sharing. The Gruffalo author tells the story of a crab that finally manages to finds a shell to live in to keep him safe from the dangers of the world. Along his journey he meets an anemone and a bristleworm who co-inhabit the shell until one day they all grow to be to big for the shell and crab evicts them. Once they are all separated they are all lonely and sad and a ‘terrible storm’ crashes in. After the s Lydia Monks uses wonderful colours and glitter when illustrating this lovely book about sharing. The Gruffalo author tells the story of a crab that finally manages to finds a shell to live in to keep him safe from the dangers of the world. Along his journey he meets an anemone and a bristleworm who co-inhabit the shell until one day they all grow to be to big for the shell and crab evicts them. Once they are all separated they are all lonely and sad and a ‘terrible storm’ crashes in. After the storm dies down the crab and anemone are too shy to speak to each other until the bristleworm pops his head out of a beautiful shell and welcomes them all home. The message is about co-operation and the different jobs all three are doing all of the time to make their world work. I know children will be delighted by this book and I would love to share it with them. 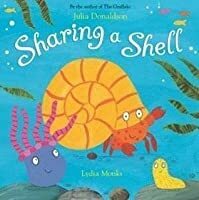 Sharing a Shell is about three little sea creatures who end up sharing a home together (a shell) in a rockpool. One day two of the friends argue and all three end up living separately. A big storm arrives one day and destroys the creatures homes, the three end up realising that friendhsip is important and that they need each other so find a bigger shell to share. The story is all about friendship and how being stubborn can affect that. The story is told in a rhyming fashion and has colouful illus Sharing a Shell is about three little sea creatures who end up sharing a home together (a shell) in a rockpool. One day two of the friends argue and all three end up living separately. A big storm arrives one day and destroys the creatures homes, the three end up realising that friendhsip is important and that they need each other so find a bigger shell to share. 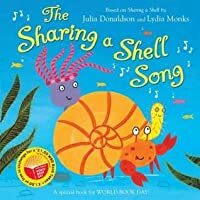 Sharing a Shell is a book about a little hermit crab who finds a shell and then makes friends with an anemone and brush. They share a shell and are happy but as they get bigger they begin to argue and fall out. Eventually they go their separate ways but are not as happy alone. Then a big storm comes and they are shaken up they realize they would rather be together and find a bigger shell to share. 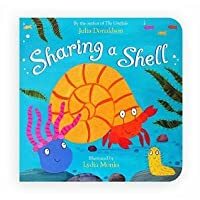 This is a good book for teaching young children about sharing and how we can sometimes be happier wh Sharing a Shell is a book about a little hermit crab who finds a shell and then makes friends with an anemone and brush. They share a shell and are happy but as they get bigger they begin to argue and fall out. Eventually they go their separate ways but are not as happy alone. Then a big storm comes and they are shaken up they realize they would rather be together and find a bigger shell to share. A symbiotic relationship turns sour in song when a seaside house-share turns into a noisome nightmare. Brief collaboration becomes open competition for space in a place out of the sun. It is only when confronted by ecological disaster that the seafoods in this study resume co-operation, but by then they're living out of a plastic cup in a storm-trashed disaster zone. My daughter loves the glitter pages! It is a really nice book that teaches children all about sharing and learning to get on with other people. This would be a great book to take to the seaside if you are doing some investigations in rock pools. Not in the same league as her classic book The Gruffalo, but enjoyable enough. Attractively illustrated and with a message about living together being better than living apart, as a crab, a sea anemone and a bristleworm share a shell. A fanastic book to teach little ones to share. It even shows how there's always someone caught in the middle and gets hurt by the fighting between two good friends and how it's ok to have disagreements but it's better to get passed them because friends are one thing in this world you need. My son enjoyed this book, although when it started I did think Oh no it doesn't have The Gruffalo flow. Terrible to compare the two I know but it soon picked up and really enjoyed! A lovely book about the value of sharing and cooperation. Clearly an early JD children's book, prior to the Axel link-up, this book has a quaint story but little to recommend it. Another hit from Julia Donaldson. we love all her books in our house.